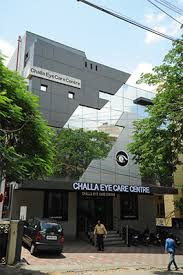 ICL Phakic IOL Treatment Hyderabad | Challa Eye Care Centre. ICL or Implantable Collamer Lens is also called as phakic IOL is an artificial lens implanted into the eye in front of natural lens to correct any focusing error like Myopia, Hyperopia or Astigmatism. This procedure is usually performed in patients with refractive errors desirous of getting rid of glasses but are not suitable for Lasik. What is Phakic IOL (Implantable Contact Lens) ? Phakic IOLs (intraocular lenses) are an alternative to LASIK and PRK eye surgery for correcting moderate to severe myopia (nearsightedness), and in some cases produce better and more predictable vision outcomes than laser refractive surgery. Phakic IOLs are clear implantable lenses that are surgically placed either between the cornea and the iris (the colored portion of your eye) or just behind the iris, without removing your naturallens. Phakic lenses enable light to focus properly on the retina for clearer vision without corrective eye wear. Implantable lenses function like contact lenses to correct nearsightedness. The difference is that phakic IOLs work from within your eye instead of sitting on the surface of your eye. Also, phakic IOLs offer a permanent correction of myopia, unless the lens is surgically removed. Dr Ravi Prasad Challa is a leading Eye Specialist in Hyderabad and one of the pioneer in phakic IOL eye Surgery.